Here is our sweet girl after grooming. I can't figure out what I am doing wrong it was the normal size but for some reason I can't get it the size it was. All I can say is that I must have done something wrong. Sorry.Hope you enjoy this one of Winter. Great photo she came out OK. Rats, can't see the picture at all. Did an update last night and now the 'puter is giving me fits! I'm sure she's adorable! Oh, now the pic came through! I was right, she's adorable! Her sweet eyes are melting my heart. She looks just lovely all groomed pretty and modeling for the picture. You have a lovely little girl there Yoka. Hope you all are doing well and having good weather for some enjoyable walks on the beach. Smiling here reading the comments. Thank you all very much for the compliments of our sweet Winter. Am just so sorry she never learned to play with toys and we have a basket full with toys. Her favorite place is right on my lap. Am nearly cross sighted on this important day.Tonight starts Yom Kippur I will be skipping the service tonight but hope to be there tomorrow.I have to fill in for a very sweet teacher and she is very talented. She has the honor to get the last eight blessing before the reading. I will take over for her with the children. It is only for the reading part. to say the blessing before and after each portion. I have a terrible headache and watery eyes.Don't feel well at all but I will be taking her place tomorrow no matter how bad I am. I guess I need to take some medication and will rest this afternoon. To all my Jewish friends I wish you a easy fast. I am not aloud to fast and even take water with me in the service. Hope all of you are doing well and hope to catch up after Yom Kippur. Love to all. Yoka, Levi,Winter and Angel Moshe. Yoka, your girl Winter is so BEAUTIFUL!! It sounds like she is a real Sweetheart too! Thank you very much Jackie and Sophie Lucille for the compliment. 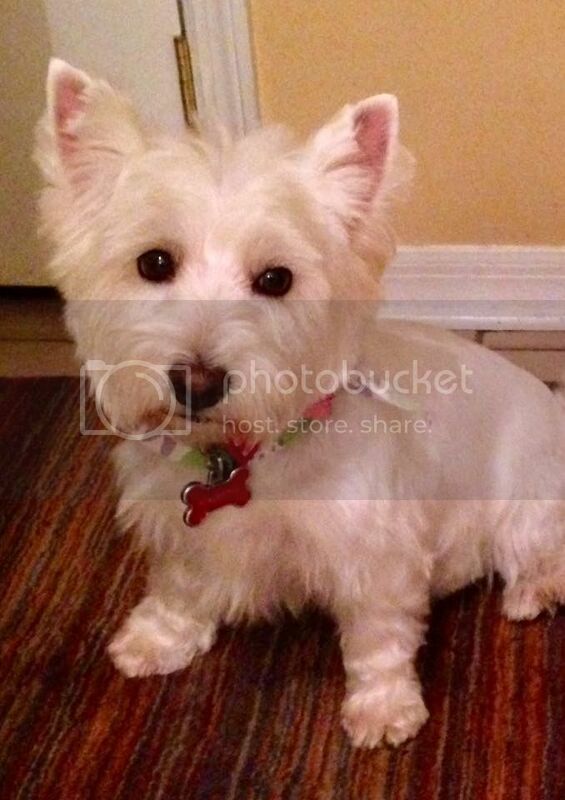 Winter is a very sweet Westie and she is our first girl Westie. A little hyper sometimes but we are so lucky getting her. Winter is very smart and loves taking a walk. We are enjoying her a lot . Levi is 13 and a sweet boy too. They love each other a lot.